Some trends come and go, but one that deserves to remain in the past is textured (or “popcorn”) ceilings. Between 1950 and 1990, contractors thought of it as a great way to hide the joints of a home or any painting mistakes. Despite their ability to mask mistakes, people have fallen out of love with the look, and getting rid of popcorn ceilings is now a common home remodeling project. As people flock to the Raleigh-Durham area of North Carolina, many are moving into older homes and find these popcorn ceilings overhead. Before you hop on the scrape-off train, there are some things to be aware of. Before 1980, asbestos was used in a lot of construction materials. 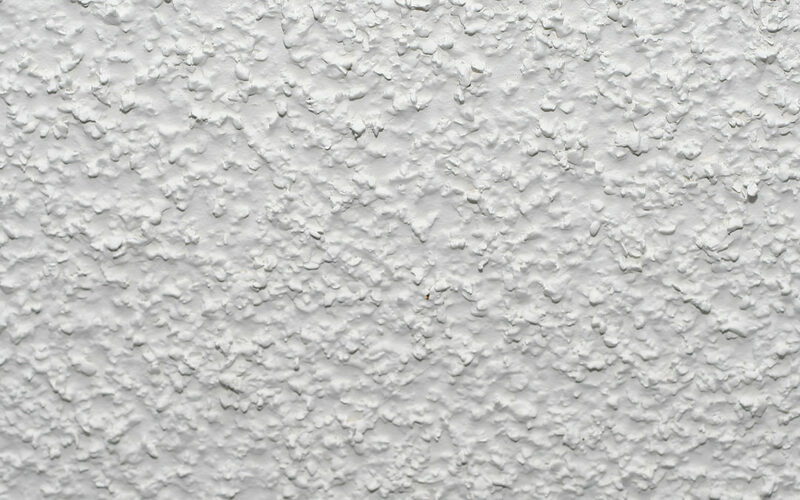 Popcorn ceilings after 1980 should be in the clear, but older textured ceilings need to be tested before they are removed. Having the dust from asbestos airborne can not only be harmful to your health, but you are required by law to have professionals handle the job depending on the percentage present. Once you’re sure the ceiling is free of asbestos, you can plan on removing it. Before you do though, you’ll want to prepare the room for the dusty job that is about to take place. Take the furniture out of the room and place plastic sheeting around the room to pick up loads of inevitable dust. Secure the plastic with painters tape. There are different schools of thought on wetting the textured ceiling before scraping, but it is much easier to remove when wet. Some suggest not wetting it because it can damage the drywall underneath if it’s over-moistened. Others say they have better luck mixing in a little soap with the water in a spray bottle before spritzing the ceiling. At the very least, dampening the ceiling will control the dust better. If the ceiling was painted after texturing, the water might not penetrate as easily. Once the ceiling has been scraped, which is a long and messy job, it’s time to clean up and fix the ceiling. With DIY jobs, there are often gashes in the drywall that will need to be spackled before the ceiling is repainted. Let the spackle dry, sand it; then you can paint the ceiling again. Because this process is so dusty and difficult, others recommend simply drywalling over the entire ceiling with a new layer of lighter board. While this can seem easier, there are problems with this approach too. It’s hard to maneuver full sheets of drywall and secure them to a ceiling, especially when it’s unclear where the best places to screw are through two layers of drywall. Your best bet is to have a professional do the job for you. Avoiding mountains of dust, potential asbestos contamination, and paint dripping from the ceiling is easy if you leave it to the experts. Robert Gordon Services is a professional Triangle area company with experience replacing these unattractive textured ceilings. Residents of Raleigh, Durham, Cary, Morrisville and the surrounding areas can call 919-250-8038 to get this eye-sore removed immediately.